Many folks skip right over The Mai-Kai’s “mild” cocktails, heading straight for the medium-strength classics and high-octane strong drinks on the voluminous menu. But that would be a mistake. 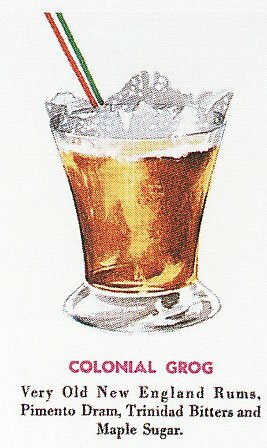 There are many tasty cocktails on the less-intense side of the menu, including the Samoan Grog, one of the top picks among all the “mild” drinks. In the case of this and several others, “mild” is a misnomer. Sure, it contains less alcohol than some of its stronger brethren, but the Samoan Grog packs quite a punch with its complex, exotic flavor profile. And like more than half the drinks on the menu, it’s a descendant of a Don the Beachcomber classic, the Colonial Grog (see ancestor recipe below). Original Mai-Kai mixologist Mariano Licudine had a knack for turning old-school Don the Beachcomber cocktails from the 1930s and ’40s into sweeter, more accessible Mai-Kai staples. Sometimes, like in this example, all it took was a few simple tweaks. 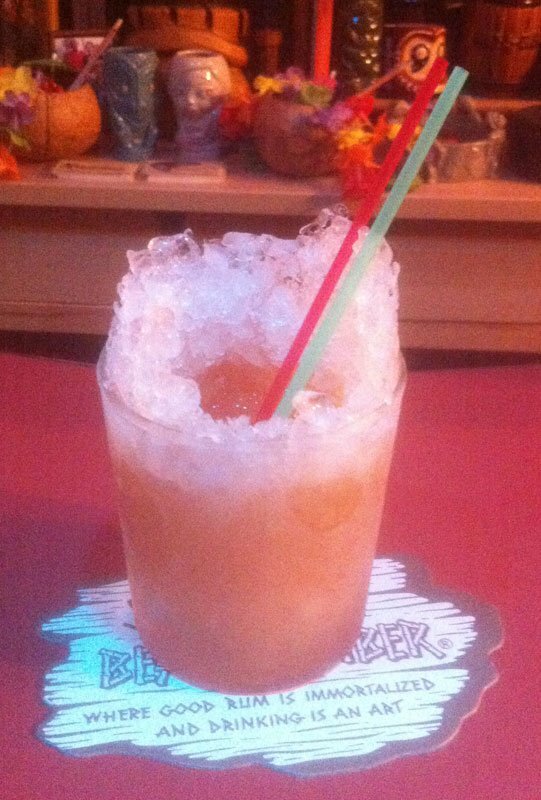 This cocktail is also an example of how research into the link between Don the Beachcomber and The Mai-Kai can sometimes take a few twists and turns. It was originally thought that the Samoan Grog was a descendant of Don’s Own Grog, a similar drink that appeared in Beachbum Berry’s Sippin’ Safari in 2007. That drink dated back to to the 1930s, when Licudine worked at the flagship Don the Beachcomber location in Hollywood. 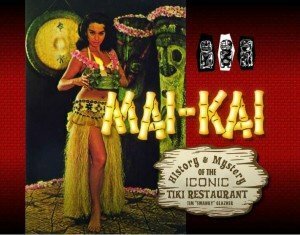 So I was fairly certain that this had to be the inspiration for The Mai-Kai’s mild drink, which has been on the menu since opening day in 1956. But luckily Jeff “Beachbum” Berry continues to unearth long-lost recipes (and puts them in some great books). 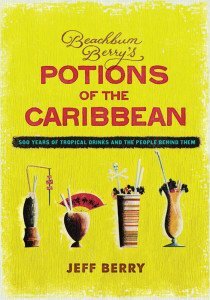 His latest tome, Potions of the Caribbean: 500 Years of Tropical Drinks and the People Behind Them (Cocktail Kingdom), includes another deep dive into the legacy and history of Donn Beach (as Don the Beachbomber was known), among many others. And right there in the middle of Chapter 5 is a full page dedicated to the Colonial Grog, which bears a striking resemblance to the Samoan Grog. Not surprisingly, this circa 1944 (previously unpublished) recipe comes from the private papers of Mariano Licudine, who worked at Don the Beachcomber from 1939 to 1956. You’ll find the recipe below, along with instructions on how to make its unique ice shell. The Samoan Grog may not get the attention of its stronger cohorts on The Mai-Kai menu, but it’s a classic example of cocktail history in a glass. A pleasant blend of rum and tangy juices. Dry and frosty. Flavor profile: Lime, exotic spices, gold rum, a hint of honey. 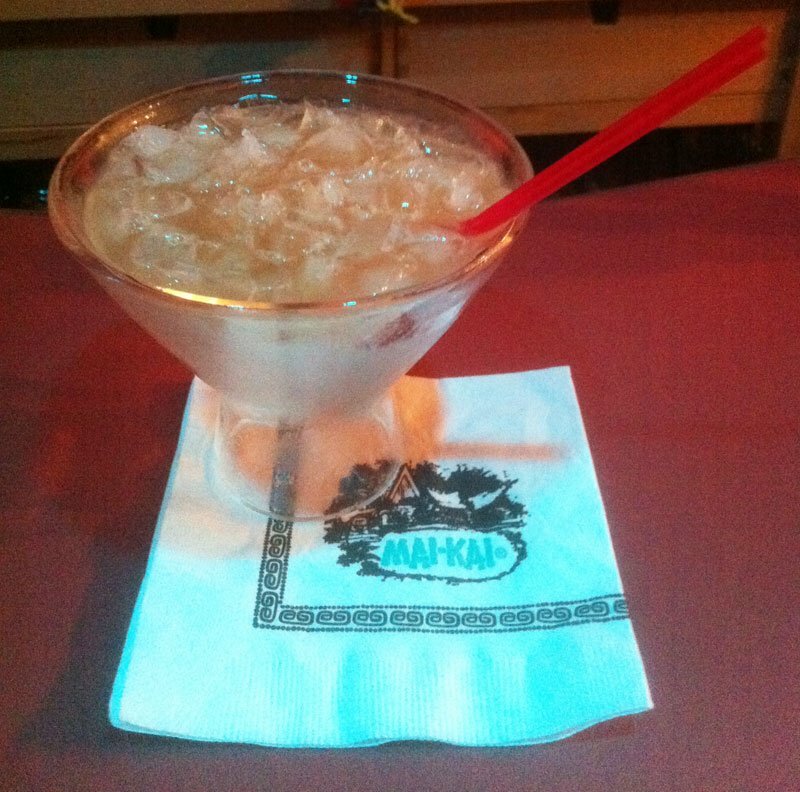 Review: Perhaps the best mild drink at The Mai-Kai, very complex and savory with great spicy, sweet and dry nuances. Ancestry: On the menu since opening day, the Samoan Grog is The Mai-Kai’s take on the Colonial Grog, a 1940s era drink by Don the Beachcomber. Bilge: The Samoan Grog is one of three “grogs” on The Mai-Kai menu, along with the strong Yeoman’s Grog and the after-dinner Kona Coffee Grog. Blend at high speed for no more than 5 seconds. Strain through a fine-mesh wire sieve into a small speciality glass lined with a thick shell of ice (instructions below). By Don the Beachcomber, circa 1944. 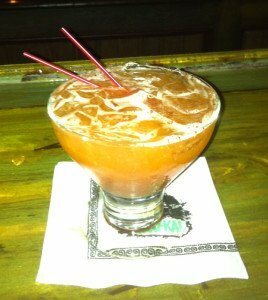 The Colonial Grog is a stellar small sipper, spicy and sweet with bold flavors. * This is a small drink, so be sure to use quality ingredients. I used Cruzan gold and Kohala Bay dark rum with nice results. Appleton rums would be another fine choice. * Maple syrup was not unusual as a sweetener in old-school Tiki drinks (see Captain’s Grog, Hai Karate and the Volcano in Beachbum Berry Remixed). It was popular in the ’30s and ’40s, and it has made a comeback lately among craft cocktail enthusiasts. * Pimento dram, aka allspice liqueur, can be found in many Don the Beachcomber and Mai-Kai cocktails. It provides an exotic, spicy nuance when applied in small doses. It can overwhelm a drink, however, if not used with restraint. 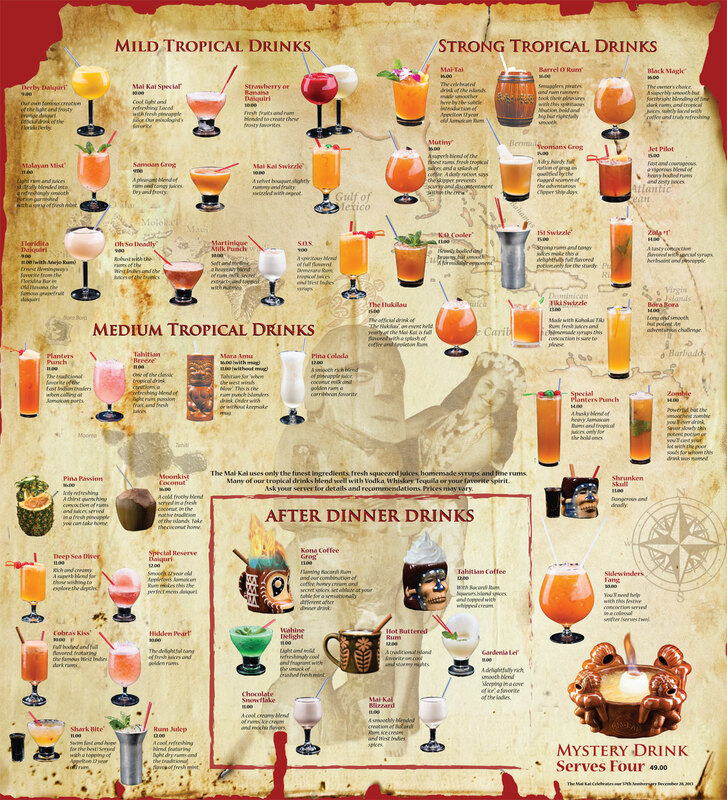 * Potions of the Caribbean includes a detailed back-story on the ice shell featured with the Colonial Grog. I encourage you to buy the book to read about this and other fascinating tales of the pioneers of mixology. Ice features in general are a relic of the early days of tropical drinks, when they provided a “wow factor” that appealed to many customers bored with the pedestrian presentations of the day. * This is actually one of the simpler ice features to make. It’s essential, however, to have an ice crusher or snow cone machine that makes finely crushed ice. A typical ice crusher won’t due. I’ve had great results in making shells, cones and other ice features with this model from Deni, though you can probably find a cheaper option. A food processor might also do the trick. * Prepare a large amount of finely crushed ice and fill a small glass about three-quarters full. Use a wooden muddler in a circular motion to hollow out the center and press the ice against the walls of the glass. Add more ice and continue this routine several times until you get the effect of the ice shell extending up above the rim of the glass. You might have to keep trying several times to get the shell just right. As long as you have enough ice on hand, it’s just a matter of patience. Once your shell looks good, set it aside in the freezer for several hours or overnight to completely set and get the glass nice and frosty. Pulse blend for no more than 5 seconds. Pour into a chilled cocktail or specialty glass. Add more crushed ice to fill. * It’s likely The Mai-Kai uses its standard well rums with this cocktail, but feel free to upgrade to Appleton or another premium brand to suit your tastes. * A few key changes give this version of the drink a distinctive Mai-Kai flavor, a trademark of Mariano Licudine. He often used honey mix as a sweetener, and it’s clearly distinguishable here. A 2:1 ratio of honey to water (mixed and chilled) will add a richer flavor. Dropping the soda water and replacing straight allspice liqueur with Don’s Spices #2 also adds more sweetness and depth. 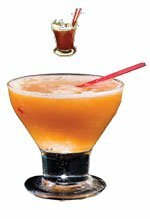 As revealed by Beachbum Berry in Sippin’ Safari, Don’s Spices #2 is a mix of equal parts vanilla syrup and pimento liqueur. It makes sense that Licudine would use this less bracing alternative to straight pimento dram to make this cocktail more accessible and worthy of the mild menu. 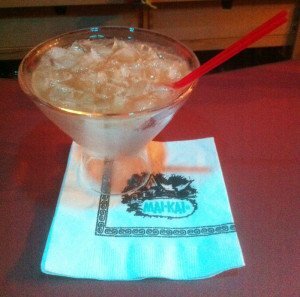 * The artwork on older menus shows an ice shell similar to the Colonial Grog’s, but The Mai-Kai no longer features it with this drink. You can find a similar ice feature with the Hidden Pearl and Tahitian Breeze. 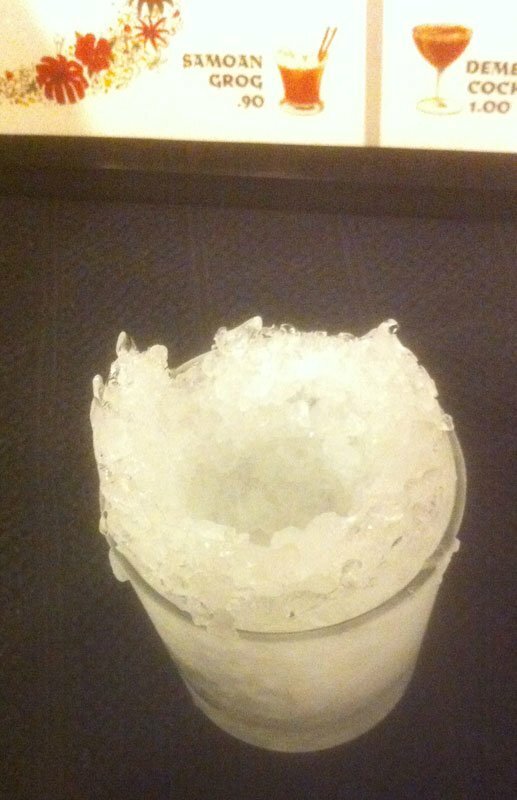 Neither, however, include the ice rising up above the rim of the glass. This likely became too difficult to produce and was discontinued over the years. But if you’re feeling ambitious, by all means add a vintage ice shell for a true taste of the original Samoan Grog. This entry was posted in Cocktail reviews, Cocktails, Cocktails, Mai-Kai, Recipes, Rum and tagged Beachbum Berry, Colonial Grog, Don The Beachcomber, Mai-Kai, Mariano Licudine, recipe, rum. Bookmark the permalink. This one was a bit too sweet for me. However, I really appreciate your site. You should write a book on tiki drinks. Excellent update on the history of this one. Makes me thirsty!